Streaming Netflix movies directly to your DS is a possibility, according to Nintendo of America President Reggie Fils-Aime. With Netflix streaming movies, game consoles will almost certainly be among the recipients of this new service. But what about handhelds? The DS technology is already sufficient for streaming movies, Fils-Aime said. "We've already shown an ability to transmit content from the Wii to your DS," he said. "We do it with [Nintendo of Japan's video-on-demand] Wii No Ma service. We can transfer game demos from the Wii to the DS too, so the technology is absolutely possible," Fils-Aime said. While there are no plans currently in motion, Netflix has been polling users to see what platforms they'd like to see the service available for. 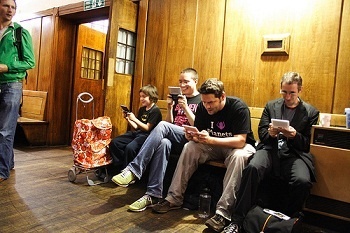 The DS is among them, and Nintendo is certainly receptive to the idea. "Netflix is a wonderful partner and one thing they do is utilize data and consumer research and they are constantly asking their user base all kinds of questions," Fils-Aime said. "So for them, they're constantly looking for ways to bring their experience to as many people as possible." Nintendo's obvious interest isn't surprising. This service could be hugely popular and profitable for both companies, and the enthusiasm is definitely there. There's no official word yet, but who knows? We may hear more soon.